Saw this strange toy in Rustan's today. Had to take a pic. 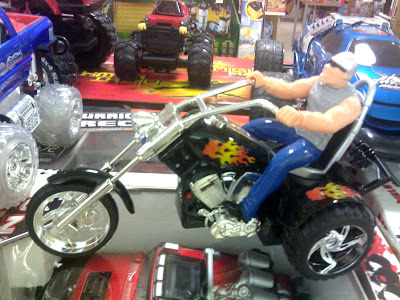 It appears to be a clean-shaven Paul sr. on a trike. Couldn't seem to fix the front fender though. Then the toy demo guy saw me ogling at the thing, and decided to amaze me by operating it. And like clockwork, as if he'd been doing this since birth, he slapped on some batteries, and whipped out a controller! The thing's an RC toy! Pretty cool! And then some weird 80's-ish hair metal song was blaring through a speaker somewhere in the bottom. That was the dealbreaker. I promptly ran away screaming in the opposite direction. I saw this too. The saleslady was cute.